well I wouldn’t say full size. It’s 49 inches tall. I can get a riser to make it taller. It was really me and my daughter to play so it is a good size for her to stand up and play. She is 6 years old. I am 40 so hell I don’t mind sitting down and playing. I ordered the wood kit that came with the plexiglass and t molding. I designed the art and sent it to the guy and he applied the art for me. I would have liked to do it myself so I could center the control panel better but hey. All the other stuff I ordered from amazon and I put it together in 2 days. I made this other one 2 months ago but I sold it to get the new one. I am confused by the image size of the template and the beautiful artwork you have posted here. When I open up these images, they are 68.903 inches by 48.681 inches at 72 dpi. I was considering sending one of them off to a service that prints in vinyl but I’m perplexed as to what size they will print it with these dimensions. Please help? I’ve tried printing the image that doesn’t include the side panels with a A3 print size and use shrink to fit media but they come out a bit large. More large than just the bleed. Hi Wheelhorse. Your designs are fantastic. I’ve recently purchased the new Picade with the 10" screen. Would you be able to send me the Red NEO GEO MVS design at 300dpi,if you had time, so I can use it on my build? screen hole should be 5-7/8" x 7 5/8"
We are going to need something better than a jpeg. Here is my 2018-2019 Picade with temporary Spiderman Art. The art is going to get changed soon. Looks wonderful. Hard to pick what art you want on it right. It is. I think i am going to use the Marvel theme. Not sure yet. 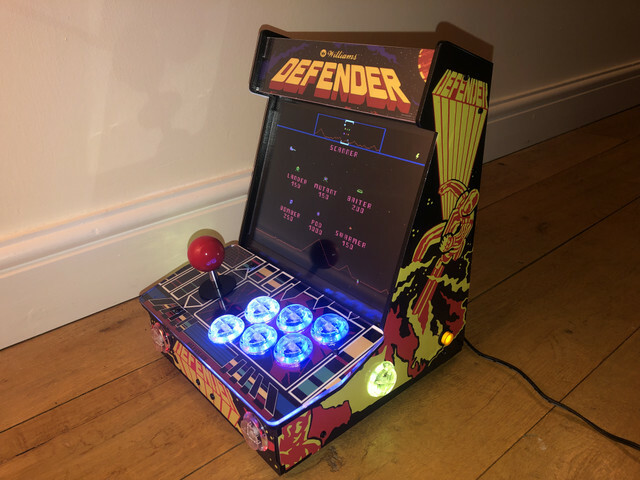 Here’s how my Picade turned out using Wheelhorse’s Defender theme! Wow. That looks great!! I love the buttons. Hi angel77lopez, want to get printable version of your RP .jpeg for my Picade. My email is annaclets@gmail.com. Thanks loads! I was referring to Post # 552, Retropie design you posted last Aug 2018. Looking forward to receiving printable version, annaclets@gmail.com. Thanks in advance!!! ok sent it to you. Enjoy. Thanks for your reply, but I should have asked for post # 551, with the Retropie logo on the marquee. Could you also send me this? Thanks much! I have just got my new 10" picade and almost finished putting it together, i was a little disappointed in the artwork that came with it as it seems low resolution, then i found this thread and would love proper artwork for the little machine that could. Would it be possible to get the puzzle bobble files so i can get those printed using the ebay link mentioned in this thread as well.